Allow me to let you in on a little style secret: sometimes I copy looks right out of street style, editorials and other bloggers. I can't help it - I'm not nearly as creative as I'd like to be, especially when it comes to layering! 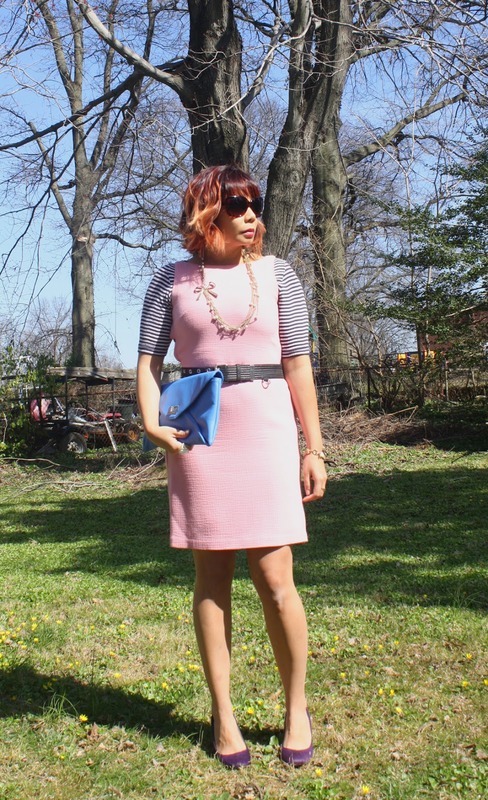 Amusingly enough, this is the second time I've copied a blogger's top under dress outfit! Before we go one, can everyone please notice my new, absolutely amazing red ombre hair? I adore my colorist, definitely go see Sylvia at Noufal Haircolor Studio if you live in the DC Metro! So I always seem to forget that layering under can be just as chic as layering over! Wait, is there really a difference? Either way, definitely try a top under a dress for a fresh take on clothing you already own! I'm wearing: Tocca dress, Express striped top, Marc Jacobs belt, Kors Michael Kors heels, SXUC sunnies courtesy of Sunglasses Shop, Rachel Leigh necklace, South clutch, Juicy Couture bracelet.